Top 10 reasons you NEED a Soup Maker in your life! I have to admit, that when I was asked to try out the new Morphy Richards Soup Maker, I was a little sceptical at the point. Soup is so incredibly easy to make anyway, why would you need a soup maker? But after a measly 5 minutes chopping/preparing, and 20 minutes drinking tea (while the soup maker did its thing), I stand corrected! Not only does it make soup unbelievably easy to conjure, it saves on washing up and frees you up for 20 minutes to do other things without having to check back at all (perfect dog walking, hair washing or tea & cake time!). I find soup easy to make as I have always made it, but to some the idea of making soup from scratch is quite daunting, complicated and time-consuming. The soup-maker gets rid of all those worries. My first experience saw me making Sweet Potato & Red Pepper soup. I kind of made it up as I went along, so I’ll share the recipe with you, it turned out absolutely delicious (if I do say so myself)! Find the Sweet Potato and Red Pepper Soup Maker Recipe here. This Morphy Richards Soup Maker has a 1.6 l capacity, giving you about four good bowlfuls of soup (although they say it feeds up to 6, it wouldn’t be enough for me!). Really, and I mean REALLY, quick – Chop, press a button and twenty minutes later voila, a healthy meal. 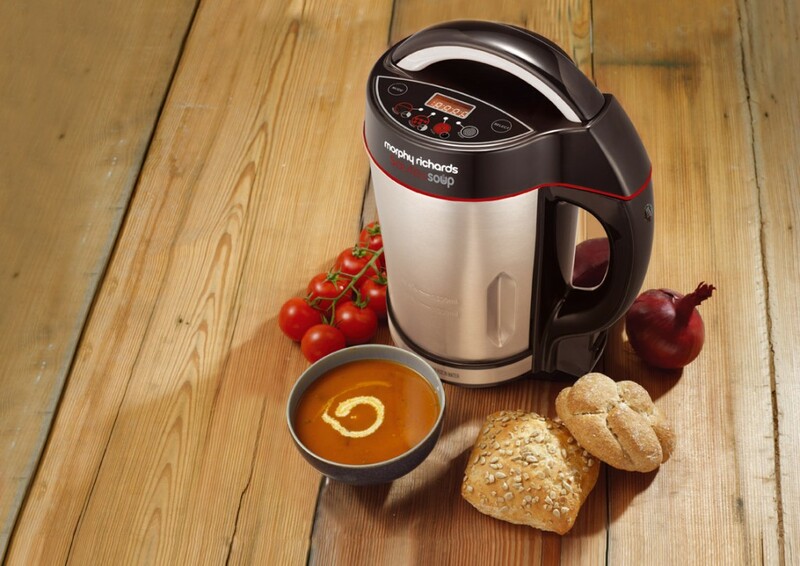 You can also read our Top Tips for getting the most out of your Soup Maker blog, for the best tips on usage and safety when using your favourite new gadget! To visit our range of Home Electricals, click here. Find the Sweet Potato and Red Pepper Soup Recipe here. cooking, kitchen, Morphy Richards, Soup Maker. Bookmark. agree!!! and more cupboard space needed for yet another gadget that only does one thing. There’s nothing wrong with just good old cooking! And it is sensory, you get to smell the food while it cooks, test it, season as you go. Got this as a present, it’s wonderful! It allows me to be very creative, I just make up combinations and they all come out delicious. Following recipes is a dream, it turns arduous into achievable. My mum has been wanting to get a soup maker for the longest time. Sending this to her. Thanks!